Congratulations on surviving another weekend without Lent Madness! If it’s easier to make it through these dark days, just think of it as a Lenten devotion within a Lenten devotion. At least this past weekend you were able to get your Lent Madness fix by reading about it in the Washington Post, Toledo Blade, and St. Louis Post-Dispatch. And if you’re among the large contingent of those who prefer to read about Lent Madness in Portuguese, it was featured in Gospel Prime (we think they said flattering things but we really have no idea). After today’s match-up featuring two female monastics, we only have two more battles left before the start of the Round of the Saintly Sixteen. Check out the updated bracket and the calendar of upcoming battles and then go vote! Rosa de Lima (1586 – 1617) was born in Lima, Peru, the daughter of Gaspar Flores, of Puerto Rico, and Maria de Oliva, of Lima. Her Christian name was Isabel (Elizabeth) and she took her nickname “Rose” at the time of her confirmation. As a young girl she copied Catherine of Siena in fasting and penances (though unlike Catherine, she didn’t lose to Emma of Hawaii in Lent Madness last week). As she aged and some in her family’s social circle started to comment on her growing beauty, Rose cut off her hair to the great consternation of her father. While her family did not approve of her strong devotion and determination not to marry, her father eventually gave her a room to herself in the family home. While a young adult, Rose spent her days helping the sick and hungry, selling her fine needlework for others, and growing flowers to support her family. She spent her nights in prayer and, though her father forbade her from becoming a nun, Rose joined the third order of Saint Dominic when she was twenty years of age. She suffered excruciating agony of mind and desolation of spirit but maintained a strong hope and faith in the midst of this. Rose died at the age of 31 and, in an extraordinary gesture, was eulogized by the archbishop at her funeral in the Cathedral. 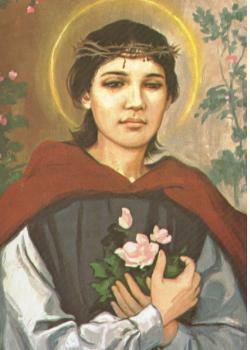 Rose of Lima was the first person born in the Americas to be named a saint by the Roman Catholic Church. for the sake of Jesus Christ our Saviour who is alive with you in the unity of the Holy Spirit, one God, now and forever. Amen. The life of Brigid of Kildare straddled the end of the fifth and beginning of the sixth centuries as well as Ireland’s historical moment when Druidism gave way to Christianity. Born of a slave mother to Dubhthach, the poet laureate of the king, Brigid grew up in a Druidic household, but was herself always drawn to the God revealed in Jesus Christ. 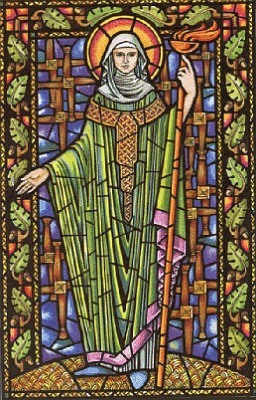 Brigid became a nun and, in 470, founded the nunnery at Kildare. In another straddling of the line between Druidism and Christianity, the site was the location of a cult to a pagan goddess whose sacred fire was constantly maintained. Brigid’s nuns took over the maintenance of this fire and Brigid slowly claimed the flame for God’s use alone. In a remarkable and unprecedented move, Brigid invited the monk Conlaed, along with his brothers, to join her at Kildare, making it the only double monastery of men and women in Ireland. Kildare became a place of learning, and it produced some of the most beautiful illuminations of the Bible ever created; sadly, these have all been lost. In her role as abbess, Brigid had as much power as many men in Ireland, and she wielded it with wisdom and compassion. Many of the miracles attributed to Brigid happened in her response to the poor and sick. Following the Lord’s example, she cleansed lepers and restored sight to the blind. As her fame spread, she took on the mystique of a folk hero, making the fanciful and factual stories about her difficult to separate. But one thing is sure: Brigid’s contagious Christianity led many to move away from Druidism and toward Jesus Christ. While this process was slow, her influence brought a legitimacy to Christianity superseded only by Saint Patrick’s. In a final straddling of Druidism with Christianity, her feast day is February 1, which coincided with (and then supplanted) the Celtic festival of Spring, called Imbolg. Collect for Brigid of Kildare: Everliving God, we rejoice today in the fellowship of your blessed servant Brigid, and we give you thanks for her life of devoted service. Inspire us with life and light, and give us perseverance to serve you all our days; through Jesus Christ our Lord, who with you and the Holy Spirit lives and reigns, one God, world without end. Amen. 83 Comments to "Rose of Lima vs. Brigid of Kildare"
My Mom’s Mother was Brigid of Athy in County Kildare- need I say more…. When you are in Kildare, the locals (at the Local) will tell you that Brigid is slightly more important than Patrick…. So much of Brigid’s life is mythic, or blended with the mythic — but I think this is something that simply increases her influence in Celtic Christianity. She gets my vote, as much as I revere St. Rosa. My vote for Brigid mirrors Laurie Atwater’s reasoning .. it was a difficult choice for me. Dia daoibh. Tá sé Bríd Chill Dara. Níl aon amhras. Oh, please translate . . . thanks! Again, for my Irish grandmother. And ditto whatever Eric said … Seriously, because Brigid lived in a time of great change and by her presence and faith helped facilitate that change. That resonates with me from my time in Sudan. Rosa doesn’t deserve to have to go against Brigid. Having spent last evening at a Chieftains concert in Virginia Beach, I must cast my vote for Brigid of Kildare. While her legend may in fact contain a blend of fact and fancy, I as you what saint’s does not? And for that matter, what Irish legend does not. Slainte! to Brigid! I voted for Rosa, though I agree with Lauren, she probably doesn’t stand much chance. But she reminds me somewhat of my daughter, who at this moment is on retreat with an indigenous healer, “Mama Terra”, in the Sacred Valley of Peru just north of Cusco. I guess my vote’s a gesture of solidarity for an adopted “home team”. I read that Rose not only cut off her hair, but rubbed pepper on her face to mar her beauty and moved into a stable or shed on her family’s land, in order to identify with the poor and avoid distractions. Does anyone know if this is true? Mischiefing in the brackets, Saint Rose vs Holy Force of Nature Brigid. air do dheagh shlàinte, Brigid ! Ditto what George said. Alas, I foresee a matchup between Bonhoeffer and Brigid in the Elate Eight – a bracket buster if ever there was one! Brigid is my name in religion! My name Saint! How could I not vote for her! Come on!!! Vote for Rose! I understand but do not accept the church’s encouragment of anorexia, hysteria and an abnormal emphasis on virginity in young women. Contrast this with Brigid, abbess of a combined house, keeper of ancient traditions, probably conflated with fertility goddesses. This was a no brainier for me. Thanks for the clarity Barbara! Your comment was the tipping point for me today! Brigid it is! Barbara, you nailed it! I taught girls for over 20 years and have 2 daughters of my own – sorry Rose, you meant well but you’re a little behind the times when we’re in need of vibrant spiritual role models for our young women. Has to be Brigid for me. Love the weaving of fantasy and fact and love that it is said when she was received into monastic life, the bishop used the ordination prayer for a bishop, having recognised the anointing of the Holy Spirit on Brigid. And how could I not vote for the name saint of my friend Sister Brigid Courtney–who is also a woman of joyous, generous and contagious faith! So vote for Rose, even if only out of revenge for Catherine’s sake. Must I hold this grudge? How unchristian! I love both saints and especialy Brigid for the fact that her legends and reverence stretches back into Paganism. That our faith reveres both the mythic Brgid and the sophisticated, modern and documented Evelyn…well it’s all so wonderful, isn’t it? Delaying my vote until after lunch. Must examine my conscience. Gotta be Brigid! Brigid’s Well is truly a place of healing, even with some rather odd accessories built over the years. I’ve prayed for healing and found it there, and been privileged to read a lesson at Eucharist in her Cathedral. And I want to know what Eric and Don said!!! Have to go with Brigid, the first woman to be ordained a Bishop. Her life’s work would be a source of inspiration in modern times; particularly amazing considering the time in which she was living. I’m for healthy living styles, etc. She may be losing right now, but St. Rose of Lima is my patron saint. Go ROSE! Brigid of Kildare–there should be music for this one–Irish music of course!! Our Lord Jesus excercises his influence on an island far from Galilee and include a coed monastery for good measure. Blessed Brigid!! Maybe I picked a winner at last! I’ve always been a fan of Bridgid and the Celtic view of Christianity so I was glad to see Columba win. Maybe its a comeback for Celtic Spirituality? I am holding out hope that either Brigid or Columba ultimately reach for the Golden Halo. Go Celts!!!! Yes, Rose did take those further ascetic steps as well–very common in her day for men as well as women (Catherine’s self-flagellation was explicitly modelled on Dominic’s). She hardly deserves to be attacked as hysterical, and her choice for virginity should be respected as her personal vocation and a very empowering one in a culture in which married women were the property of their husbands and huge numbers of them died in childbirth. Also, she did not take Rose as a confirmation name; rather, a family member (grandmother, if I recall correctly) bestowed the nickname on her as a very young child. This write-up also seriously downplays (or is ignorant of) the connections between Brigid the saint and Brigid the Goddess–one of the appealing features of the saint for those who aren’t pagan-phobic. The eternal flame mentioned was dedicated to the Goddess Brigid, Brigid and/or her nuns may have begun life as her priestesses, Imbolc is strongly connected with the Goddess as well, and many of the legends and customs (Bride’s bed, Brigid crosses) associated with Brigid are direct parallels/descendants of those regarding the Goddess. It’s a refreshing change from the emphasis on conflict with Druid holy men and the Druid faith in Patrick’s life. Regarding the pagan connections with Brigid, this has been pretty thoroughly laid to rest recently by early medieval scholar Lisa Bitel (whose specialty is early medieval women). She shows that non-Christian Irish people associated the saint Brigid with their holy sites retroactively. It might not be a convenient fact, but as a medievalist I can say the scholarship is impeccable. Rose of Lima fans better start voting or this will be an upset…. Being Hispanic, I have to vote for Santa Rosa de Lima (Saint Rose of Lima). AACK! This is a toughie…but I think I have to go with Brighid…I detect a “unseen hand” at work in the initial match-ups…Santa Rosa de Lima offers a witness of faithful dedication…whi knows what she might have become had she lived into middle age? On the other hand, we have some idea of what that could look like in Brighid…God bless my Belfast grandparents who would have had nothing to do with either of these women…their loss! Well…..almost a toss-up, if you will…BUT….Brigid has to be admired for weaning the pipple away from or for blending the Druidism and Christianity, a feat of no small measure. I tend to have the “willies” over the extremes of morbid stuff as sometimes exhibited by Rosa but then, who am I to question anybody else’s off-beat, quirky behavior ? Well…not too much of the quirks. I’m torn on this one, but have to give props to my Dominican homegirl, Rosa de Lima. Word to the Blessed Mutha! I have to go with Brigid, with all the Irish in my background. Even more, Brigid is a major presence in the mysteries with one of my favorite ‘detectives’, Fidelma of Kildare. Great novels! They were instrumental in forming what it means to me to be a strong, independent Christian woman. Brigid for me too! My grandad comes from Kildare – not the best reason – but what can I say! A real ascetic for me, as opposed to one who may or may not be real at all. SEC, not sure whether my ADD just kicked in or not, I may have voted twice, I was so enthralled by the previous Comments! If so, please cancel out the first vote! (Or the second, they WERE the same!) And, someone DO please provide a translation of the Gaelic! I THINK I probably agree! Well friends, I have to say it is Brigid hands down for this celt of the diaspora. Also the fact that Brigid, like Martha (of Marth&Mary the orginal M&M fame) takes the road of incorporation versus repression. Depictions of Martha in the So. of France show her with her girdle wrapped around the dragons mouth whom she has subdued with love and always keeps within sight. As with Martha, Brigid took the clear eyed, conscious road that Paul recommends, finding the witness to God in the present place and going forward from there, and while Sts. George and Patrick drove the pike through the heart or drove the snakes out of Ireland to lay festering in the unconscious to rise again in many a sea of troubles, both Sts. Martha and Brigid took the conscious road of knowing and naming with public incorporation leading to wisdom and connection. No wonder she was able to found a double house! Rosa lived a Godly life…but it seems Brigid had far wider influence. You know, it’d be nice to have some more choices who weren’t in Holy Orders. But that’s kind of my complaint about the entire Kalendar. It sets up this false expectation that to live a truly holy life, you must either be ordained or a monastic. Brigid also wanted to give God a lake of beer, so that the heavenly host would be better able to celebrate for all eternity. You just wait, Jon…Had to hold some stuff back for Round 2 if she moves on. Oh yes, we will have the lake of beer. Gotta vote for sweet Rosa. Her picture is real pretty, and, if there’s one thing our church has enough of, it’s white people! I was led to read more about St Rosa, being attracted to someone who “suffered excurtiating agony of mind and desolation of spirit” and yet was still able to have hope and faith. My experience has been that people in that condition, some who have been huge saints for me, no longer have access to the hope and faith of their healthy selves. The Catholic Church offers two sites, one of which states that it is suitable for viewing by children. Even so, you get a pop-up offering a book titled “Tortured for Christ”. It sounds like St Rosa lived an extended suicide, leaving her unable to minister to others. I can’t see how that is God’s desire. I like underdogs, but I am reluctantly voting for Brigid as a healthier icon for us. To me since saints are often humble and you may not know their influence until much later, while I consider that some it’s more about how the person continued to to draw near to God and pursue the call they perceived and use the gifts and strengths they had… which is different for each. I went for Rose, who seems to be the underdog at the moment. Both did a lot, fascinating bios. But I feel Brigid is more well known thus “popular”. Rose seems to have done a lot at a young age, against family discouragement and expectations by avoiding marriage (which she didnt feel called to) and going ahead and joining an order giving priority to her faith, in addition to her living it out by ministering to the sick and poor. This is the first bracket that I don’t seem to have a lot of feeling about, for some reason. Poor Rose is being creamed at this point — 83-17. So she needs my vote more than Brigid. I share Beth Ann’s views on poor Rosa. All I did earlier was to wish everyone a good morning. As we’ve moved on to afternoon, I changed the greating. There are many reasons why I’m a Brigid fan, but the lake of beer story has to be one of the best! we are studying saints during Lent and we just discussed Brigid yesterday! She was an amazing woman and so I just had to vote for her. I love the phrase “contagious Christianity” and voted for Brigid. From an early age, I’ve always felt a sympathy for saints like Rose (and Catherine) who went to extremes to experience God. Certainly not the calling that everyone receives but one that seems especially grace-full. Hadn’t Abbess Brigid also taken a vow of virginity? And, if called to this state, how is it unhealthy? There are other issues involving Rosa of Lima that today we would call abuse. This a tough one. I like Rose of Lima on her own merits and thinking she might be the underdog in this one for a number of reasons wanted to vote for her… But in the end the call of “The Great Mother” who shines so strongly and calls forth so persistently in Brigid won out. I appreciate dr. primrose’s standing in solidarity with Rose. She represents a form of ascetic suffering spirituality I – as a 20th/21st century North American – really struggle to understand. It is a valid stream – perhaps to do with solidarity with the suffering in the world? the understanding that this world is not all there is? but I can’t get over my reaction of suffering as a bad thing, and I see the willing pursuit of same as the antithesis of Jesus’ ministry of bringing healing and wholeness. Brigid’s hospitality may be too “easy” a path, but it’s the one I see Jesus’ invitation in more clearly (despite the ‘miracle’ claims on her behalf, which always leave me cold). Rose did a lot of good in alleviating suffering of others so if someone else wants to vote for her to honour that, or as a vote for something the total opposite of “prosperty gospel” (I’m not a fan of that either), God bless you and please do. I’m just wary of the mindset that misery is a hallmark of holiness so am going with Brigid today. In honor of Mary Duffy, of County Mayo, my great-great grandmother, who came to the United States at age 18, and according to the immigration papers, “could not read.” I guess you don’t need to read to have great courage. Brigid gets my vote today. I go for Brigid this time around. I am much less into the self-abuse model of asceticism than I am into the proactive ministrations of Brigid. Someone commented about the choices being ordained or monastic. Queen Emma was neither. Rose of Lima es Boricua! Que cheveré! But her suffering! I did some further reading about her and it made me so sad. It’s hard to accept in my mind that that type of self mutilation wasn’t uncommon in the day as a road to Christ. It seems so abhorrent now, but then? Difficult to judge, but reading her story brought out the ‘ay bendito’ from me! Brigid gets my vote, as a strong wise woman, able to combine the Druidic roots with the Christian flame, and stepping into her power as an Abbess, able to draw in the brothers to a double monastery. A very cool role model! Rose is one of those saints, like the pillar standing monks of the desert, who’s life made a lot of sense at the time and not so much in the current age. Brigid seems more like us – the monastery of both women and men – but I’m not sure that she really was like us. The Anglican Church, though not venerate the saints, gives a much larger space to the “heroes of faith” than most other evangelical churches. In your church calendar, Lent, or the 40 days preceding Easter, is respected. To encourage devotional readings during Lent, the Rev. Tim Schenck on his blog created a contest where saints are made daily and can be “eliminated” in an online poll, similar to what happens in the “Big Brother”. This year the competition was http://www.lentmadness.org your own website where readers may learn more about the saints and elect “winners” until only one who will win the coveted prize of the “golden halo” on the Wednesday before Easter. For three consecutive years, the competition called “Lent Madness” [Madness Lenten] was conducted online as a competition which had the support of many faithful. The competition created by him includes 32 men and women considered “holy” by the Episcopal Church. Schenck explains that the “holy bishops” are “heroes of the church … They are not perfect, but they were faithful.” Unlike the Catholic saints, were not formally canonized. The Saints selected are a diverse group of men and women who are in the Bible or had an important role in church history. In each round, they are presented with minibiografias, emphasizing aspects of his life and works. The initiative has the support of other pastors like the Rev. Scott Gunn. He led the campaign that secured the victory of the priest and poet George Herbert, who lived in the 17th century. Three years later he is still participating and campaigning online for their favorite saints. “One of the things that’s wrong with Christianity today is that we take very seriously, but do not take Jesus seriously enough,” said Gunn. Pastor Gunn believes the game to eliminate the Saints increase their visibility by using modern means of communication such as Facebook and blog. Until now, the main Madness Lenten had more than 150 000 visits, with an average of 2,000 constituents per day. In the first year were only about 100 voters. “This year it just exploded,” said Schenck. Patron saint of my diaconal ordination, St Brigid it is for me. We are still reeling from Santa not making it into the next round. But we think he us super busy with his elves getting all of the toys made so maybe it was a good thing. We like both choices today, but in the end we voted for the saintly woman from Ireland. My vote is for Brigid of Kildare. Her life was focused on the poor and those who needed help with their life. Her monastery housed men and women; and was a remarkable place of learning. “The abbesses of Kildare had an administrative authority equal to that of a bishop until 1152.” Her life’s work reached far beyond that of her life. Here we go again, “anorexia, hysteria, and an abnormal emphasis on virginity”! Must we judge people who lived hundreds of years ago by 2012 standards??? How do you think people will view us 200 years from now? I shudder to think….Wasn’t Jesus tortured before being nailed to a cross? He showed us to embrace suffering, not to shrink from it. The saints have much to teach us, if we would only listen without judging by our narrow minded patronizing ….Go St. Rose of Lima! Well, we are who we are, and we kind of have to go with the knowledge we have — I don’t believe self-induced anorexia is any more a sign of holiness than epilepsy is a sign of possession by evil spirits. . . but those ideas certainly had their heydays. Rose of Lima took our household hands down today. Rachel read about her (and actually, we made a figure of her for a mobile we made for All Saints in Sunday School) this fall and as soon as she found out she was on the bracket– it didn’t matter who she was up against. As Episcopalians, we pitch a pretty big tent. Two of my favorite authors, Laurie R. King and Dorothy L. Sayers are (were) Episcopal theologians. Another favorite author Charlane Harris, author of the Sookie Stackhouse series upon which the television show True Blood is based is an Episcopalian. President Gerald R. Ford was an Episcopalian. Robin Williams is an Episcopalian. I don’t expect everyone to agree with me, and in fact, with an Episcopalian crowd like this, it would frighten me very much of you did! Dear St. Rose of Lima, in her short life, overcame her family’s objections to her vocation. She spent her life in prayer and in caring for the sick. Though she lived the life she wanted, it seems she wasn’t particularly happy. Perhaps she overwhelmed by unexplained sadness. In spite of her difficulties, St Rose is still revered by many people. St. Brigid lived a longer, apparently happy, life. She founded a community, later inviting monks to live in the same community. She managed to sort of translate Druid religious practices into Christian, thus winning converts to Christ, the true light of the world. I see St. Rose as a true servant of Christ; St. Brigid as a true leader for Christ. I voted for St. Brigid. Although I am largely a supporter of Brigid, having studied the colonial era in Latin America and in the interest of including nonwhite voices, I vote for Rose of Lima today! I’m a rebel. I voted for Rose and on the church’s bracket board I’m listing her as the winner! Besides, what do I say to the Latinas I serve if they see that TEC is still overpowered with Anglo sensibilities. And, since there are so many comments, I’m fairly safe in posting this since I doubt anyone except the Madnessmasters will read it.